A question came into the Packet Pushers mailbox along these lines. If a unit has two power inputs, should one go to UPS and one to street power, or is it better to have both power supplies fed by the same UPS? The issue with raw street power is that it isn’t conditioned. So, voltage and amperage irregularities might happen — events affecting the power grid can also affect whatever is plugged into it. One visible effect of this is a brown-out, where lights dim when the power grid is overtaxed. Voltage spikes can also occur, often in the form of nearby lightning strikes, although lightning can find all sorts of paths into a device, not necessarily following power lines. In any case, this sort of unpredictability in the street electrical supply can damage power supplies in IT gear, making conditioning of some sort important. Another in-rack UPS issue worth considering is that in-rack models don’t do well when overloaded (i.e. more electrical draw is requested than they are rated for) meaning that they’ll overheat or otherwise shutdown if too much is plugged in. You can’t power the Space Shuttle with a 9-volt battery. Even when a UPS is working properly and loaded appropriately, it will likely only offer minutes to an hour or so of uptime during a total power outage, although that depends on just how much load is placed on it by the plugged in equipment. The point of the above paragraphs is less to highlight the shortcomings of various power sources and more to point out that you don’t want your power supply eggs in a single power source basket. While power problems are rare, they happen. The rule I follow is power diversity, if at all possible. Don’t make the mistake of running dual power supplies off of the same power source. Yes, there are risks with UPS’s, and there are risks with street power, so hedge your bets. Here’s a strategy that I believe is a good compromise. conditioned by a quality surge suppression strip. Use the UPS for the other power supply. Many power strips are rack-mountable, so you should be able to keep things neat and tidy, as opposed to dropping a power strip on the floor under the rack. This all depends on budget. A final point worth considering is that you don’t want to rely on street power and in-rack UPS if you don’t have to. In data center deployments of size, a common practice is to have an “A” power feed and a “B” power feed (and perhaps more) that provide fully conditioned and redundant power feeds throughout the data center. In these scenarios, the data center is powered by street power which is conditioned and fed into power distribution units throughout the DC. When the street power fails, a generator kicks on to power the DC. A bank of batteries buffers the quick transition between street power and generator. In many DC, A and B are often just different distribution panels fed from the same UPS (or static-transfer switch). More benefit accrues if A and B are from independent UPS, fed from independent transfer switches, fed from independent generators (and utility feeders), etc. To expand on the two UPS image and A/B power approach, I generally do this for my one-rack clients by putting two UPS units in the reach, and feeding them with power sockets that go to opposite phases from the breaker panel. This ensures good isolation from street power, and also ensures that, should a phase drop (I’ve seen this happen twice in the last 5 years), you still have power to one side of the system. You can generally expect that two breakers situated next to each other are on alternate phases, but should consult with an electrician to be sure. Things can get complicated if you have 3 phase power in your server room. I like to use an automatic transfer switch (ATS) to switch between street and UPS power as needed. That way you can lose either side for extended intervals without worry, even on a single power supply device. to build besides a network that is completle redundant also a power supply system that is also redundant. I also agree that 2 independent power supplys is a must have for all network components. replacement or maintandance if needed. The primary power supply would go into the UPS and the secondary power supply to a PDU. To use a PDU gives the benefit that it can be monitored in the same way as you can monitor the UPS and gives you a basic protection against peaks in the street power system. If we are talking a SOHO server room then two UPS. 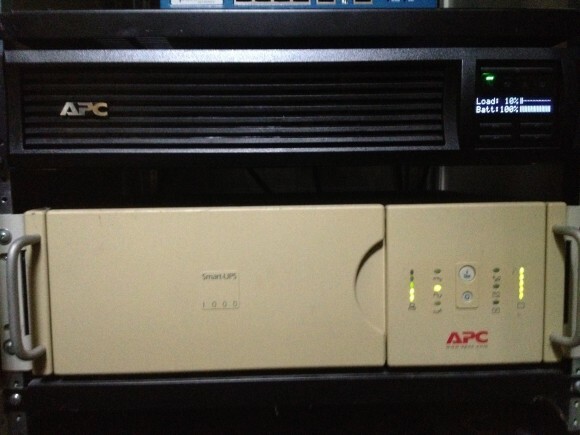 A dual PS unit will distribute the load across both UPS systems. Therefore if you were to use shore power + UPS. Then shore power will immediately fail in a power failure situation, thus transferring all load to the UPS (hope it handles 100%) and this will also cause more draw on the UPS thereby draining it faster.